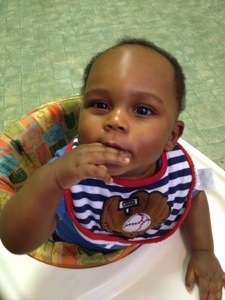 Lewis just began eating the Gerber Graduates Puffs. They are a snack that helps babies learn how to pick things up and feed themselves (hand eye coordination). 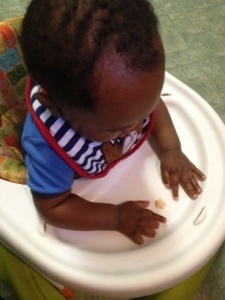 As he maneuvers around in his walker in the kitchen, I put a few Puffs on the tray of his walker. He fiddled around with all 5 knocking about 2 to the floor and trying to grab all of the other 3 with both hands til his hands were to full to put to his mouth. We as Gods children want all of our blessings now now now! But as He gives us a few at a time we fumble over them.. Wasting most of them and unable to maintain the remaining ones. When God gives of one thing to handle we have to learn how to use it, learn its purpose, so that we can be proficient in it, able to benefit from it. Once we get that one down, then we are more responsible to get the next and then the next. Then success…we are benefiting, reaping our reward, enjoying the fruit of our labor.